This second recording from Jeremy Yowell includes all your favorite Celtic hymns & songs — “Be Thou My Vision,” “O Waly, Waly,” “Down by the Sally Gardens,” “In Christ Alone,” Air from County Derry,” “Ash Grove,” “Scarborough Fair,” and more. 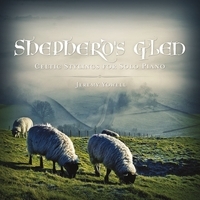 Shepherd's Glen is a collection of Celtic songs arranged for solo piano. It includes all your favorite melodies from the "emerald isle," from toe tappin' jigs to sorrowful ballads. These Celtic tunes have a way of getting stuck in our minds...maybe that's why they have withstood the test of time and are still favorites today. "Shepherd’s Glen" is the second album from pianist/arranger/composer Jeremy Yowell, following his 2012 debut, "Beautiful Shore." "Shepherd’s Glen" is a collection of fourteen Celtic-styled piano arrangements of hymns and traditional folk melodies, thirteen of which are solo piano plus one piano duet. Classically-trained from early childhood, Yowell’s playing style is confident and masterful. Sometimes big and bold and sometimes more pensive, Yowell always has full command of his instrument. Recorded and mastered by Joe Bongiorno at his Piano Haven Studio, the piano sound is warm and clear. Even if you aren’t looking for an album of piano hymns, this is an excellent collection of familiar and not-so-familiar songs played in a spirited and uplifting way. "Shepherd’s Glen" begins with “Be Thou My Vision.” The first and third verses are joyful and celebratory while the second is much quieter and more prayerful - a great opener! “Soul Storm” is a gorgeous original piece that explores the complexities of the soul in conflict. Each section of this five-minute piece was designed to lead the listener on an emotional journey, succeeding beautifully. “O Waly, Waly with When I Survey the Wondrous Cross” combines the melody of the song also known as “The Water Is Wide” with the original and the traditional melodies for “When I Survey the Wondrous Cross,” an unexpected pairing that really works. “Down By the Sally Gardens” is a traditional Irish folk tune with a quiet, hymn-like quality. Peaceful and soothing, it’s a beauty. “Lament” is an extraordinary piece composed by Melissa Yowell, Jeremy’s wife. Written during a time of sorrow, it expresses the broad mix of emotions that accompany difficult times, ending with resolve and renewed hope - breathtaking! “Air From County Derry” is a powerful arrangement of the song also known as “O Danny Boy,” played as a duet with Melissa - a favorite. Yowell’s magnificent arrangement of “A Mighty Fortress Is Our God” begins quietly and almost mournfully, gradually becoming more rhythmic but still very reflective. The second verse brings in turbulent broken chords that quickly take on strength and resolve. The third verse is a mix of emotions, finishing with triumphant passages that would make Gershwin proud! “Ash Grove with Bach’s Italian Concerto” is a tour de force that combines the traditional Welsh melody with Bach’s Baroque masterpiece. Yowell very effectively minimizes his pedaling to make the piano sound more like the harpsichord that Bach would have used. The closing track is a dark and haunting pairing of “Scarborough Fair” and “Jesus, Lover of My Soul.” An old folk song given new life by Simon and Garfunkle almost fifty years ago, “Scarborough Fair” has been traced back to Scotland around 1670 and is still compelling. Yowell’s arrangement uses the style of the great Romantic composers “because their music employs the artistic freedom and unrestrained emotion I want to convey” - a powerhouse! Give your ears, soul and mind a treat with Jeremy Yowell’s "Shepherd’s Glen."